If you’re a senior and your debts seem overwhelming, bankruptcy may be the right way to help you get a fresh start and restructure your finances. Seniors are under financial pressure like never before. According to the Washington Post, bankruptcy filings for seniors are increasing at a fast pace. Bankruptcy is a legal way for seniors to erase unsecured debt and restructure their finances in order to get caught up on payments and take charge of their financial resources. If you’re a senior struggling to pay your debts, pursuing bankruptcy can be a welcome relief and the right way to get back on track. Our experienced bankruptcy attorneys offer professional assistance for seniors who feel overwhelmed by their financial obligations. The attorneys at Lawrence & Associates provide legal services that are compassionate and understanding as we work to help you get your finances back on track. Our professionals aim to help you make the legal process as manageable as possible for all of our clients including seniors who pursue bankruptcy. Call us at (513) 351-5997 for a free consultation with no obligation. What Is a Senior Citizen Bankruptcy? A senior citizen has the right to file for bankruptcy in the United States. Even if your only income is social security, U.S. bankruptcy laws apply to give you the full protection of the law. Bankruptcy can be a valuable tool for senior citizens who need to address financial difficulties. A senior citizen bankruptcy filing takes both your income and your debts into account. While the same laws apply to seniors that apply to all bankruptcy filings, there are some special considerations for seniors to be aware of. If you’re a senior citizen who is facing financial difficulties, it’s critical to address all of the special circumstances that might apply like limited income or significant home equity. It’s important to carefully address the specific circumstances that might apply to the senior or seniors in the case. Is Senior Citizen Bankruptcy Right For Me? If you’re facing financial difficulties and contemplating your options, you might wonder if senior citizen bankruptcy is right for you. When your income doesn’t allow you to pay both your basic living expenses and your debts, the answer may be yes. Can you make debt payments and afford the necessities of life? If your debts don’t allow you to pay for your basic living expenses like food, rent, and medical care, bankruptcy can help. When you total up your income and expenses, if you’re unable to make the minimum payments on your debts, bankruptcy may be the right choice. Erasing debts through bankruptcy can make your expenses more manageable so that you can stay within your budget without stress. Are your social security payments enough to pay your basic expenses and your debts? Often, seniors live on social security payments alone. Seniors are often stretched thin just to make their social security payments cover their basic living expenses. If you’re living on social security alone, bankruptcy can help you create a workable plan to make ends meet. Do you need help stopping automatic deductions from bank accounts? If you have automatic bank withdrawals from prior debt consolidation, you may not know how to stop the withdrawals on your own. Bankruptcy can stop these actions and give you control over your income. Are you facing harassment from creditors? Phone calls and other collection efforts from creditors can interrupt your life. When you file for bankruptcy, creditors must stop their collection actions immediately. You can stop distressing phone calls, letters, and emails right away by filing for bankruptcy. Are you being sued or afraid of being sued? You might think that it’s too late if you’re already facing a lawsuit from a creditor. Fortunately, a bankruptcy filing immediately stays all formal legal action against you. The debts are addressed as part of the bankruptcy, and you no longer have to worry about pending lawsuits. Do you worry about leaving your children to address your debts? While your children don’t have to pay your debts, your estate must take care of your obligations before your children can receive an inheritance. Addressing bankruptcy now can take this burden off your shoulders and give you the peace of mind to know that your finances are in order for your children. What Kinds of Bankruptcy Can Seniors File? Seniors qualify to file either Chapter 7 or Chapter 13 depending on their income and debts. If you live on social security income alone, there’s a good chance that you qualify to file under Chapter 7. A Chapter 7 bankruptcy allows you to complete erase debts immediately upon finalization of the bankruptcy process. A Chapter 13 filing allows you to dismiss some debts and become current on other debts. Which proceeding is right for you depends on several factors including your income, whether you’re current on your home mortgage and what the real estate exemptions are in your state. Our experienced bankruptcy lawyers in Cincinnati and Kentucky can help you determine the best choice for your situation. Should I File For Bankruptcy If I Am Judgment Proof? Many people think that there’s no point to filing for bankruptcy because they have so few assets. They believe that they’re what’s called judgment proof; they believe they have no assets for a creditor to take. Clients are often surprised to learn that they have assets. For example, if you own a home, a creditor may place a lien on your home. If you deposit income in a bank account, creditors may attempt to garnish the funds. There are some cases where a senior truly has no assets, but most seniors are surprised to learn of the ways that bankruptcy may protect them from unanticipated types of collection efforts. Can Creditors Garnish Social Security Payments? Private creditors cannot directly garnish social security payments. The federal government can garnish social security if you owe unpaid taxes. In addition, if you deposit a social security payment into a bank account, it becomes open to creditor garnishment. Can Creditors Garnish Pension Checks? A creditor cannot garnish a government-issued pension. In addition, most private pensions are not subject to garnishment. Pensions for individuals who are self-employed are typically subject to garnishment. Retirement accounts are generally safe from creditors up to a certain amount. Even if you have a relatively large balance in a retirement account, it may be completely or partially protected in a bankruptcy proceeding. The amount that you can protect from bankruptcy in a retirement account is over $1 million in both Kentucky and Ohio. The retirement account exemptions may make bankruptcy a sound financial move for a senior citizen even if they have a fully funded retirement account. Do My Children Have to Pay My Debts? A child does not have to pay their parent’s debts when the parent passes away. If you leave credit cards, loans, and other liabilities in your own name, your child does not have to pay those obligations unless they are a co-signer to the debt. However, your estate must pay the debt before your child can receive any inheritance. Bankruptcy may be a viable way to address your debts so that you are not leaving a burden to your children and so that you can leave them personal keepsakes free and clear from creditor claims. What Happens If I Rent My Home or Apartment and I File for Bankruptcy? One thing to consider carefully in a senior citizen bankruptcy is whether the senior owns a home. Many seniors have significant equity in their home. There are bankruptcy exemptions for homestead property, but there are also equity limitations. It may still be possible to file for bankruptcy and keep your home, but it’s important to fully understand the ramifications and the state-specific laws that apply to your case. The experienced attorneys at Lawrence & Associates can help you address the questions that you have and the specific issues that apply to your senior citizen bankruptcy. If you’re a senior facing overwhelming debt, senior citizen bankruptcy may be the best option for you. As a senior, you are eligible to file for bankruptcy under the same qualifying standards and exemptions as all filers in your state of residency. The experienced bankruptcy attorneys for seniors at Lawrence & Associates offer kind, compassionate representation. 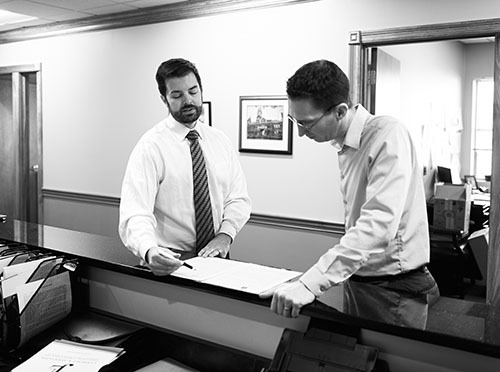 Our attorneys treat you with respect while we work with you to address your finances and erase your debts. Call us for a free, no-obligation consultation at (513) 351-5997.